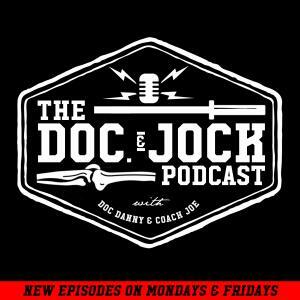 On E148 of the Doc and Jock Podcast Doc Danny and Coach Joe sit down to talk about things you should do everyday if you're training for the everyday. That seems pretty convoluted, so what does that actually mean? It means if you are someone who is training for general physical preparedness or functional fitness or whatever your thing is, these are some movements and practices you should be including on the daily and weekly to actually be prepared for everyday life. Intro to the show and topic of the day, what you should be training everyday if you are training for everyday. “If you had an extra 60 minutes in a day to do with as you please, what would you do?” Be sure to provide your answer in the comment below, in an email, or on one of our social media platforms. What does it mean to train for everyday? Why prioritizing Range of Motion must be a priority. Sprinting, being explosive, and going really hard for very short bouts. Including multiple planes of movement. Let’s not forget about gaining strength. Joe and Danny discuss how to incorporate quality strength movements. If we are training for everyday is it better to train the full body everyday or attack particular regions and how many days should we train.